Taipei, Aug. 16 (CNA) The Mainland Affairs Council (MAC) Thursday criticized China for bullying Taiwan-based 85℃ Bakery Cafe, saying that such behavior serves only to undermine the healthy development of cross-strait ties. "It is a clear case of China suppressing Taiwanese companies and the people of Taiwan absolutely will not accept such a "cultural revolution-like" scheme to coerce Taiwanese firms to take a public political stand," MAC Deputy Minister Chiu Chui-cheng (邱垂正) told a regular news briefing. China's hard-line approach to force companies, individuals and countries to accept its ideology is a distortion of universal values, Chiu said, adding that such acts will not only adversely affect cross-strait ties but also trigger a backlash from the international community. Taiwan businessmen have made a great contribution to China's economic development and their legal rights there must be fully protected and free from political interference, he said. The government understands the hardship and difficulties facing Taiwanese enterprises in China and will speak out for them if they are mistreated, he stressed. Meanwhile, the official website of 85℃ Bakery Cafe chain in Taiwan was still down as of 19:30 p.m. Thursday after being hacked earlier in the day. The website reads "website under construction." The criticism of 85℃ Bakery Cafe came after Taiwan President Tsai Ing-wen (蔡英文) visited a branch of the chain during a stopover in Los Angeles Sunday en route to Paraguay, where she attended the inauguration of President Mario Abdo Benitez Wednesday. Tsai's visit triggered the anger of Chinese netizens who labeled 85℃ Bakery Cafe a pro-Taiwan independence company and launched attacks against the weibo website of the Taiwan-based cafe chain Wednesday, threatening to launch a boycott. Under mounting pressure, the websites of the company's branches across China were all down late Wednesday. The cafe chain issued a statement Wednesday voicing support for the "1992 consensus" and appealing for the peaceful development of cross-strait ties so that companies can engage in business. Despite its pledge to back the "1992 consensus" -- a tacit agreement between Taiwan and China that there is only one China, with each side free to interpret what that means -- the cafe chain has still been removed from several online food delivery service platforms in China. 85℃ Bakery Cafe owns 589 regular chain stores in China, with sales in the Chinese market accounting for 64 percent of the company's total revenue in the first quarter of this year. 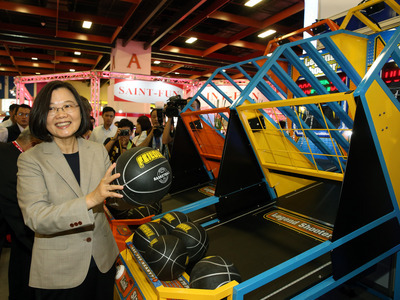 It has 29 regular chain stores and 406 franchises in Taiwan, sales of which make up only 16 percent of total revenue. The remaining 20 percent comes from the U.S., Australian and Hong Kong markets. On Thursday, Long Mingbiao (龍明彪), deputy director of the Beijing-based Taiwan Affairs Office, said China will never allow any company that supports Taiwan independence to make money in China.